What lays beyond the mystery of fishing in Panama ? Fishermen have been coming to Panama for decades to fish. 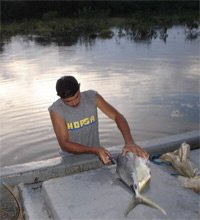 Only recently however has Panama focused its attention on tourism as a major industry, and fishing as one of its unique and largest attractions for Panama. Perhaps sooner than later, Panama will depend on the tourism sector to cover the revenue Panama depended on from the ex-US military bases, over 500 million a year that left the country. Perhaps contrary to many beliefs inside the country, Panama cannot compete against the Caribbean with its experience and combination in customer service and beautiful long white stretching sandy beaches. I would argue that those coming to Panama to fish, with 5 star service, in virgin surroundings have very little options (Tropic Star being one of them). Panama still lacks a great deal of infrastructure and it is precisely this, that appeals to people looking for opportunities to discover, or bask in the allure of rarely visited paradises. The tourists we host in Panama, go to places that many people from Panama, have never visited. Untouched beauty-is what Panama has to offer. The fact that you can plan a week long vacation and explore both oceans and beautiful mountain ridges in 60 (F)degree weather is uniquely Panama´s. It is often that I have sat with tourist from around the world and sat on an uninhabited island (Isla Iguana) in the middle of the week and been the only ones on the island. It is this, that people come to Panama for. Isla Iguana is in fact, an exception of the white sandy beach rule as it does possess a pearl white stretch of beach in its total 53 hectares. After a good morning fishing run, we often stop on the island to slice up a few filets and cook on an open fire in the local fishermen´s outside shadow rest area. .
Panama fishing´s exotic appeal lies in discovering the cultural secrets we learn from the locals. Apart from how they achieve living as fishermen, the people in Azuero (Pedasi) have a quality about them that makes us learn a great deal about human nature and fuels more of our desire to learn from other cultures. The town of Pedasi offers tourists the innocence of a small town that is the last of its kind.